In general, the OFPRA should make a decision regarding the asylum demand during 6 months for normal procedure, and during 15 days for accelerated procedures. Important: When you receive the answer to your asylum demand, you must ensure that you understand the sense of the decision! Below we are giving you some essential elements to help you understand the nature of the decision, but if you need more information, you can go see our volunteers in one of the Dom’Asile centers or other association. The OFPRA decision is notified by registered letter with acknowledgment of receipt. The OFPRA has to take a decision within 6 months if you are in a normal procedure, within 15 days if you are in a fast-track procedure. You can receive the decision or by post, or by checking a computer portal. 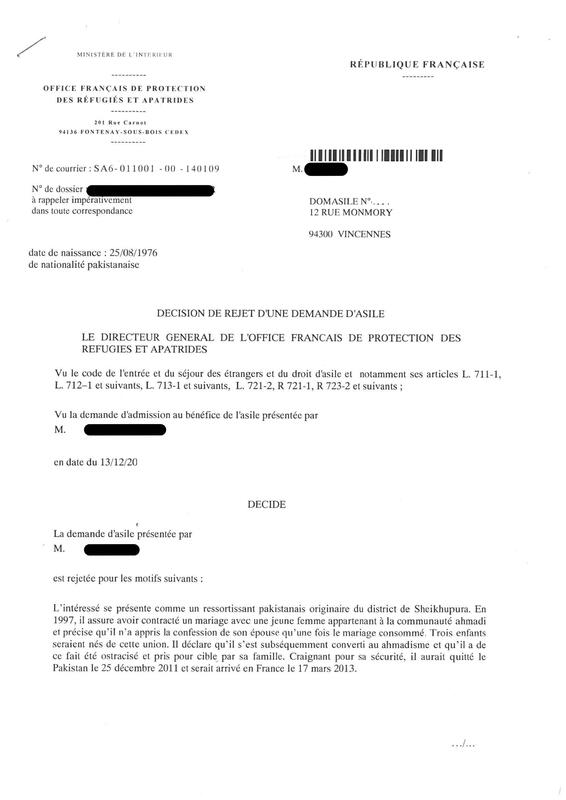 If you get this letter called “Décision d’admission au statut de réfugié”, it means you have been granted the refugee status. If you mant to read more about what you should do next, please follow the link : Refugee Status. If your received a letter called “Décision d’admission au titre de la protection subsidiaire” (photo to be added soon), it means you have been granted the subsidiary protection. If you want to read more about what you should do next, please follow the link : Subsidiary protection. If you are recognised as a refugee, you still have a few administrative procedures to make, like getting your residence permit, getting your civil status documents established. The refugee status grants you access to social rights (RSA, health insurance, reduction or free public transport) and to work. If you are recognized as a refugee: You have to go to the prefecture with the decision sent by the OFPRA or CNDA stating that you have been granted the refugee status : you can ask there your residence permit. WARNING: you will not be given your definitive residence permit (10 years permit) straight away, because you need to present the birth certificate from the OFPRA to the prefecture, as well as the OFII medical certificate and a domiciliation certificate in order to get this definitive permit. The prefecture will deliver you, within 8 days, a temporary authorization valid for 6 months (a récépissé), with the mention “beneficiary of international protection”, which allows you to work. 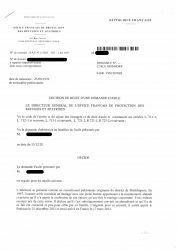 >>>When your récépissé expires, the prefecture will deliver you another one, if you do not have the birth certificate from OFPRA. >>>The prefecture may ask you a housing certificate (proof that you have a place to live in). If you do not have such a document yet, you can present your domiciliation certificate, and explain that you do not have a stable house yet. WARNING : a lot of prefectures demand a housing certificate before they deliver a residence permit. This goes against what is written in the legal texts. Homeless people may ask help from their domiciliation centre or from another association. You must join your birth certificate if you have one, or otherwise write a letter to explain why it is impossible for you to get one. >>You may be asked to present any identity or travel documents you have. If you don’t, you just have to explain the reason why you can’t get it to the OFPRA. This won’t be a problem for the rest of your procedures. >Within a month (you often have to wait for 6 to 12 months), OFPRA will send you by mail a document that will serve as a birth certificate and a marriage certificate if you are married. As soon as you receive your birth certificate established by OFPRA, you have to show it at the prefecture. -Sign the CAI contract (contrat d’accueil et d’intégration, CAI – “arrival and integration” contract). Going to this appointment at OFII’s will allow you to obtain your resident permit. You absolutely have to go there to get your resident permit ou your pluriannual card. It is an obligation to sign the reception and integration contract (CAI), to take part in the civic day and to follow the French lessons. 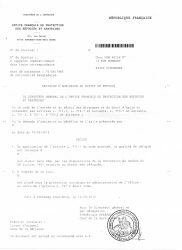 >> If you didn’t receive the OFII’s appointment 4 or 5 months after you give the birth certificate to the prefecture, try to contact the OFII to know the reasons of the delay and to check that the prefecture actually transmitted your file to the OFII. Family reunification: if the husband or wife and the children under 18 stayed in the home country and you want to make them join you in France. As soon as you get your récépissé with the mention “refugee” on it, you can apply for family reunification. Refugees do not have to prove that they have special funds or lodging. WARNING: the family reunification must be made in the French consulate of the country your family lives in. You mustn’t ask anything to the authorities of your country in France. -letter from OFPRA/CNDA granting you the refugee status. -Details about the composition of your family, with the exact address of your family out of France. -And, if you already have it: your birth certificate provided by OFPRA. Normally, the processing time would be 2 months. But it happens frequently that the control of civil status and family bounds takes more time, up to 8 months. Once they get the visa, your family can join you in France. The principle of family unit allows to grant your wife or husband (if she or he has your nationality and if you were already married when you applied for asylum) and your children under 18 the refugee status, on the condition that they are registered by OFPRA. Which means, after their arrival into France, the person will apply for asylum and will state in the file that their husband or wife or relative is a refugee. The husband or wife and the children older than 16 can then be recognised as refugees and obtain a resident permit. Even if they are not granted the refugee status, your husband or wife can benefit from a carte de séjour (residence permit) valid for 10 years. You have to have been married before the granting of the refugee status. Children must be under 19 years old. 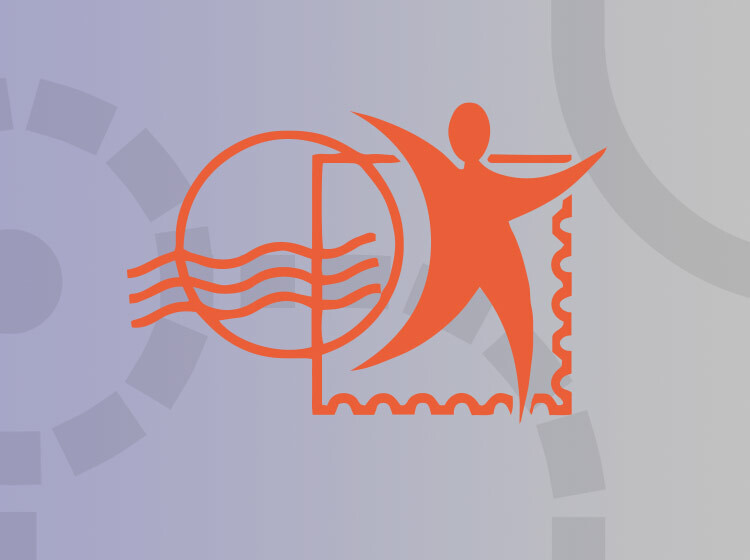 When you get the refugee status, you can benefit from some social assistance. As a refugee, you are entitled to general social insurance. You can obtain Cmu – complémentaire (that gives you access to free medical attention) provided that you are on low income. >>If you only have right to the general social insurance, you will pay your medical care, and then the health insurance reimburses you a part of the money you paid. >>If you have right to the general social insurance AND the CMU-Complémentaire (CMU), then you do not pay for your medical care: the insurance pays for you. If you want to benefit from this health insurance system, you have to go to the CPAM (The health insurance office of the area you live in). – You have no or very low income. >>If you are under 25 years old but pregnant or taking care of a child, you can also benefit from the RSA. >> If you are under 25 years old, you can go to the “mission locale” of your place of residence : this is an office in charge of helping under 25 years old young people to find work or training. – your ADA notification (the document where is written the amount of money OFII gave you during your asylum process). The amount of the RSA is about 550.93 euros per month for a single adult (since April 2018), 826.40€ for an adult with a child; with two children : 991.68€; for each added child : 220.37 €. It is re-calculated every 3 months. If you are under 25 and cannot apply for RSA, you can ask this allowance to the Pole Emploi. It is about 345e per month, limited to twelve months. You have to go and apply for it at the Pôle Emploi office. Refugees and persons under subsidiary protection can be entitled to family benefits if they fit the criteria (expecting a child, having a child aged less than 3 years old, having two children or more, raising a child alone…). Information can be given by a social worker. With your attestation of complementary CMU (social insurance), you can get a 50% discount on your train and metro tickets for Paris and the suburb, and 75% on the orange card. When you have RSA, it is completely free. Call the free number 0800-948-999 to get the file to fill in. If you have been granted refugee status or subsidiary protection, you have the right to work and this right is mentioned on your récépissé. To help you beginning your job search, you can register yourself as a job-seeker in the Pôle Emploi. The Pôle Emploi is a public service, in charge of registering job-seeker and heping them find a job. You can be registered with the Pôle Emploi to get help to look for a job or a training by calling them at this number : 39 49 or checking their website. They will give you an appointment for registration. If you are under 26, you can get registered with the Pôle Emploi and with the local mission (Mission locale), which will provide you help and support about professional issues. 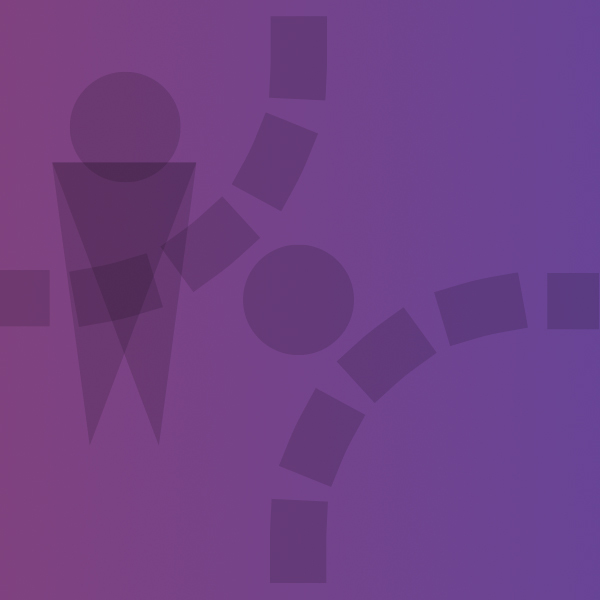 Advice: it can be faster to find a job if you get registered with temporary work agencies. These work agencies are private societies that put in relation employers and job-seekers. Generally, these agencies are specialized in one business sector (building, food service…). As a refugee, you can ask for a stay in a CPH. You have to fill the file with a social worker and send it to the OFII. If you get a place in a CPH, you can keep it for 6 months. It is called HLM (social housing). The application has to be done in the Housing service of the city council where you live. Once you have been granted refugee status you must ask for the exchange of your foreign driving license within one year. If you want to travel abroad after you obtained your resident permit or your temporary card, you have to go to the prefecture and fill a form asking for a travel document. Warning : you can’t go to your country except in exceptional circumstances (death of a member of your family, disease…) otherwise you can loose your refugee status. If you have to go to your country because of one of these events, you have to ask the prefecture for an authorisation. The prefecture will deliver you a “laissez passer” instead of your travel document. If you have been graduated abroad, your degrees can be recognized. It is free for refugees. – a half size envelope, stamped, with your name and address on it. – voluntary loss of the status: you go back to live in your country, you obtain another nationality, you managed to be under the protection of your country. -The 1C5 clause (cessation clause) of the Geneva Convention provides that the refugee status can be removed when the circumstances in connection with which he was recognised a refugee have ceased to exist.The Geneva Convention provides that the refugee can keep the status if he invokes compelling reasons arising out of previous persecution. -Penal condamnation in France or in a democratic state. >> If the refugee status is lost or removed, it might not affect your right to stay in France. If you have the subsidiary protection, you still have a few administrative procedures to make for your temporary stay card and for your social rights. You have to go to the prefecture with the decision sent by the OFPRA or CNDA stating that you have been granted the subsidiary protection: you can ask there your residence permit. 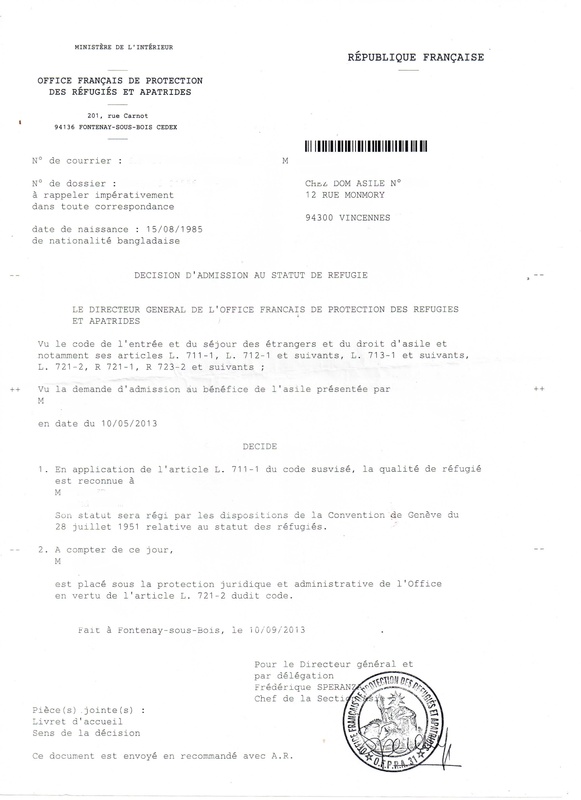 WARNING: you will not be given your definitive residence permit (pluriannual residence permit for maximum 4 years) straight away, because you need to present the birth certificate from the OFPRA to the prefecture, as well as the OFII medical certificate and a domiciliation certificate in order to get this definitive permit. The prefecture will deliver you, within 8 days, a temporary authorization valid for six months (a récépissé), with the mention “status of refugee”, which allows you to work. >>>When your récépissé expires, the prefecture will deliver you another one, if you still do not have the birth certificate from OFPRA. >>> Every year your file will be re-examined in order to know if you still have right to the subsidiary protection. After 5 years, and providing that you manage to integrate, you can be delivered a 10 years residence permit. WARNING : a lot of prefectures demand a housing certificate before they deliver a residence permit. This goes against what is written in the legal texts. Homeless people may ask help from their domiciliation centre. > OFPRA will send you by mail a document that will serve as a birth certificate and a marriage certificate if you are married. This can create a delay of several months. Going to this appointment at OFII’s will allow you to obtain your resident permit. As soon as you get your récépissé with the mention “protection subsidiaire” on it, you can apply for family reunification. WARNING: the family reunification must be made in the French consulate of the country your family lives in. You mustn’t ask anything to the authorities of your country. -letter from OFPRA/CNDA granting you the subsidiary protection. Your husband or wife can benefit from a carte de séjour (residence permit) valid for 1 year. You have to have been married before the granting of the protection. Children must be under 19 years old. If they want to, they can apply for asylum in the same time they apply for the residence permit. When you get the protection, you can benefit from some social assistance. As you have the protection, you are entitled to general social insurance which is called “Protection maladie universelle”. The amount of the RSA is about 550.93 euros per month for a single adult, for adult with a child 826.40euros, with two children: 991.86 euros, for each added child : 220.37€. With your attestation of complementary CMU (social insurance), you can get 50% discount on your train and metro tickets for Paris and the suburb, and 75% on the orange card. When you have RSA, it is completely free. As you have the protection, you can ask for a stay in a CPH. You have to fill the file with a social worker and send it to the OFII. If you get a place in a CPH, you can keep it for 6 months. Once you have been granted subsidiary protection you must ask for the exchange of your foreign driving license within one year. Every year your file will be reviewed in order to confirm if the circumstances that led to granting you the protection are still real are if the situation changed. If the situation changed and there is no reason anymore why France should grant you its protection, the protection will be cancelled, and your one-year residence permit will be taken from you. In this case, you have essentially two choices, either you make an appeal (recours à la CNDA), or you decide not to continue the procedure. WARNING: You have to make this appeal within one month after receiving the decision from OFPRA. If you did not make your appeal in the one-month term you had, you cannot contest the OFPRA’s decision anymore. If later new things happen after the OFPRA decision and confirm again your fear to go back to your country, you can think about a reconsideration of asylum application.